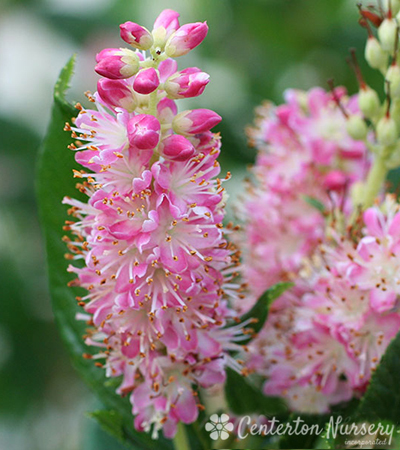 Summersweet – Clethra | Faddegon's Nursery, Inc.
Jun 23, 2016 | Shrubs, Trees & Vines, What's New? Unless you have already experienced a clethra, it’s easy to overlook during a spring trip to the garden center. One of the later shrubs to leaf out and flower it might give you the impression that it’s not much to look at especially when it’s surrounded by azaleas and roses. But just wait until summer! Dark glossy leaves will unfurl, and then the buds begin to flower and up come long blooms of white or pink. Then the fragrance begins. Ask anyone who has a clethra in their garden what they love most about it and you will undoubtedly receive this response; the fragrance! July and August bring the sweetest blooms. Clethra doesn’t stop there. In fall the foliage turns a deep golden yellow adding to the autumn landscape.Clethra is also known by the names Summersweet and sweet pepperbush to many garden and nature lovers. In its original form, Clethra Alnifolia, can be found growing near woodlands and bodies of water in the Northeastern U.S. This will tell you that it thrives in rich moist soil and partial shade. Since it is a plant that tolerates (even wet feet) a variety of situations it will certainly do well in full sun as long as the spot is not hot and dry. Sugartina ‘Crystalina’ offers the same great characteristics as the native clethra in a smaller package allowing gardeners with tighter spaces to enjoy its presence. This hybrid will grow to only 3 feet at the most with a spread of 4 feet. Planting it along with some of the spring flowering shrubs will ensure a full season of flowers and color into the fall. When cooler weather arrives the foliage of ‘Crystalina’ turns a beautiful golden yellow.‘Sixteen Candles’ has the advantage of being a medium sized plant prized for very dark green foliage as well as all of the aforementioned features of a clethra. ‘Sixteen Candles’ grows to a height of between 3 and 5 feet blooming in summer with white upright flowers. The “candles” are longer than those of ‘Crystalina’ growing to 6″ long. This is a very sturdy selection which spreads easily to fill in an area. If spreading is unwanted, new shoots can be easily pruned off.